If you haven't noticed, all the museums and galleries I visit in the Houston area are inside the Loop. This isn't because I am biased toward the central city, but for the simple reason that for the most part, there just aren't many places to see art outside the Loop. But there are some. And I visited one of these places--not just outside the Loop, but actually outside the Beltway. The Pearl Fincher Museum is located in Spring in a pretty location on Cypresswood Dr. near Stuebner-Airline (aka Veterans Memorial Dr.). It is near parks and a rather pretty bayou. 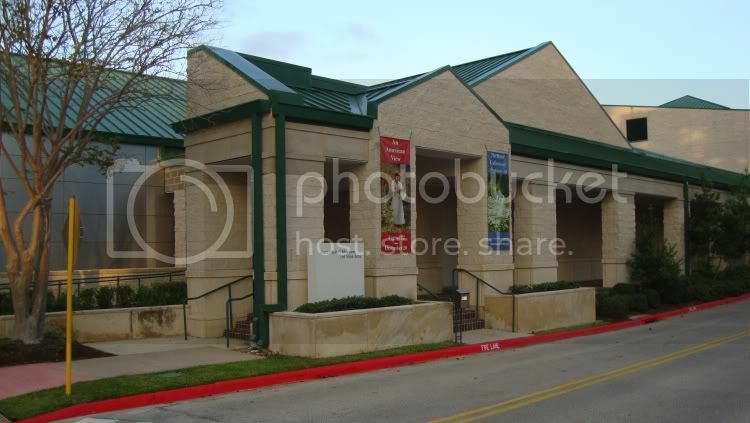 It shares a building with the Barbara Bush Branch Library (which also has art exhibits). The Fincher has some kind of relationship with the MFAH, but I think it's a distinct institution. That's one side of the Fincher (the way the building is set up, you can't really say which side is the front). The show on display is the Hosek collection--I don't know who Hosek is, but she (?) collected a lot of American paintings dating from the late 19th century to the 1940s, with a few later examples. All the art is realistic, much of it landscape (including some Hudson River school paintings) or portraiture or genre paintings. Some of the work from the 20th century is illustration work, including pieces from Norman Rockwell and N.C. Wyeth (there is a piece each by Andrew Wyeth and Jamie Wyeth as well). There were many charming pieces in the show. I liked this bit of exotica. I love the simplified forms in this painting, and the blue snow. Another one with blue snow is the N.C. Wyeth painting they had. But Wyeth's approach, which I have always loved (but only seen in reproductions), is much more hand-hewn than Dale Nichols. Wyeth always paints as if he were carving the painting out of wood. I gives them a nice texture and a very human touch. Finally, a taste of the 19th century, when New England and upstate New York were so very appealing to artists. All in all, this was a very pleasurable show. I like that it included illustration art, which is typically given a short shrift in art museum settings. I liked the nostalgic feel and modest approach. None of these artists are key players in the history of art, and for the most part, the artists here aren't among those considered the greats of 19th century American art (not like guys like Federick Church, Albert Bierstadt, Augustus Saint-Gaudens, John Singer Sargent, Thomas Eakens, Winslow Homer, or John Freederick Peto). But it's a lovely collection, worth a trip outside the beltway.